Before I went to bed last night I got all my running stuff together and set up in the bathroom (my clothes) and the kitchen (gear). My alarm went off at 5:00 am and I only hit the snooze button once. GO ME! This Runkeeper training program had me running 13 miles today. My knee was hurting most of the week from my 12 mile run last weekend so I was debating on actually doing the 13 mile run or not. Today when I started it wasn't really bothering me so I went for the whole thing. Plus .1, because why only run 13 when you can run 13.1. Originally I was going to go to town to run, but I'm just too lazy to drive 15-20 minutes and really, I know my surroundings here so much that I don't stress about people or dogs or cars or anything really. If I run the perimeter of the club it's 4 miles so I was kind of thinking going in that I would just run the perimeter 4 times. Instead I ran around one lake 4 times and another one 2 times and then down the main drag and a few other streets. I told myself I'd just take it all easy and I gave myself permission to walk a little after every 2 miles. That was a pretty good strategy I think. I did one GU at 5 miles (I was feeling good at the 4 so didn't walk there) and another at around mile 9. I had the vanilla bean one, OMG so good and the chocolate outrage which was ok too. Before I had tried an espresso one and that one was disgusting. I think having the two GU's really helped. Usually when I run longer distances I get so so tired towards the end. Today I was tired but not "I can't go on much farther" tired. When I first went out it was DARK. Like really dark felt like it was night dark. Eventually the sun came up and I started to see a few people out and about. I think if you click on the picture here it might get bigger. There is a crane on that tree in the water. So pretty I had to pause and take a picture. 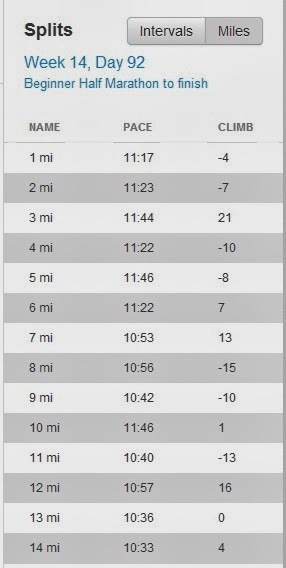 Here's my splits, you can tell I didn't walk for the last 2 miles by looking at them. I got a little bit misty at about mile 11 (after the potty break) thinking about how when I first started running I couldn't even run down one street and now I can do laps around this whole freaking place. It just goes to show that if you don't doubt yourself you can do what you set your mind out to do. Making goals is my #1 way to get motivated. Well today I have book club. I'm excited to go hang out with my book club ladies. I missed last month so it feels like forever since I got to hang out with them all. We are going to discuss the book Hello Darkness by Sandra Brown. I think I had typed in a big ol review on Goodreads and then it did a blip and didn't save it. It was a really good book! You should be misty and so proud - that took lots of determination and self-motivation to go from where you were to where you are!!! You should be giving youself major pats on the back!! WOHOOO! You are ready to roll! I can't wait for you to bust your marathon time!